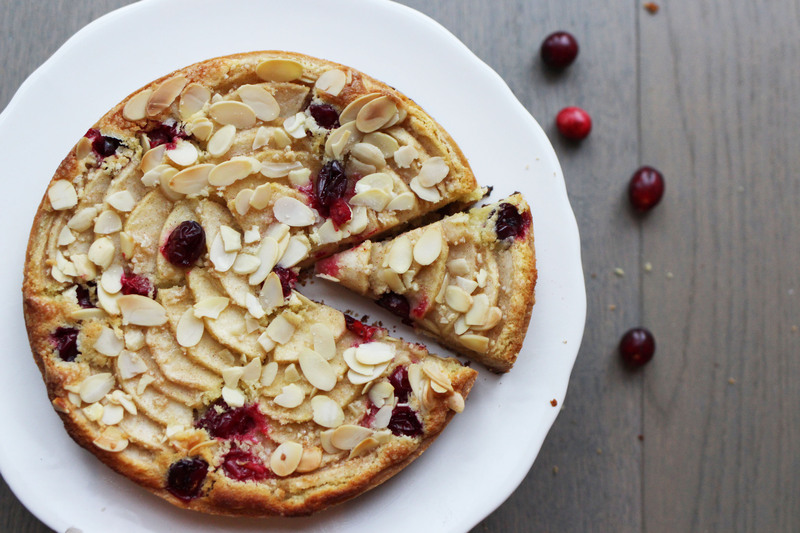 Introducing, the perfect holiday dessert tart. It’s a perfect balance of sweet and tart, soft and crunchy, fruit and nut… I mean it’s got everything! 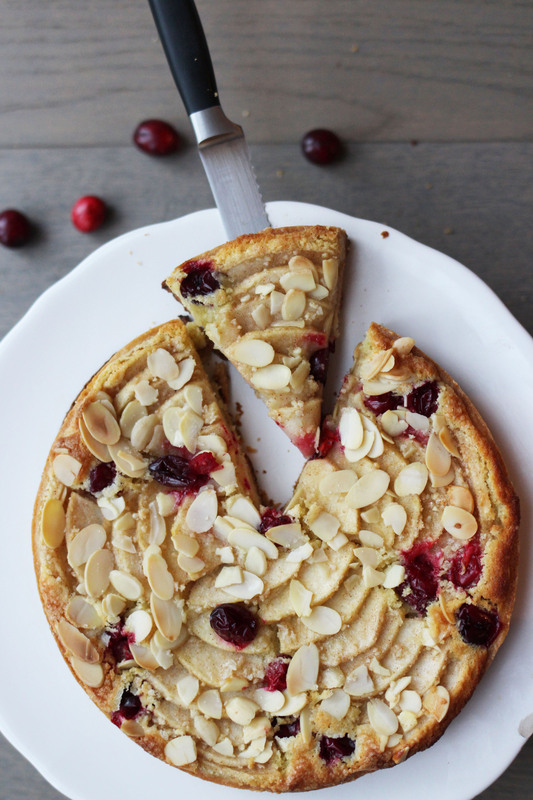 When I brought this to a recent “friendsgiving”, this cranberry apple tart stole the show when it came to the dessert course. First thing to disappear off the table—and I even saw a sneaky someone steal and extra slice for themselves! I got so many compliments on this tart that I am almost embarrassed to say that this tart was a product of a half-baked idea. Heh, baking pun. Okay, I’ll stop. Needless to say, I think my impromptu ingredient compilation proved to yield a tasty flavor profile—one that I am definitely anticipating repeating throughout this holiday season! Best of all, it was pretty easy to put together, looks drop-dead gorgeous, and tastes as good (if not better) than it appears! This is a tart-recipe keeper. I’ve already planned to bake this (or some variant of this) when I’m back home in California over Christmas weekend! Speaking of which, what are your holiday plans and your “go-to” recipes for this time of year? 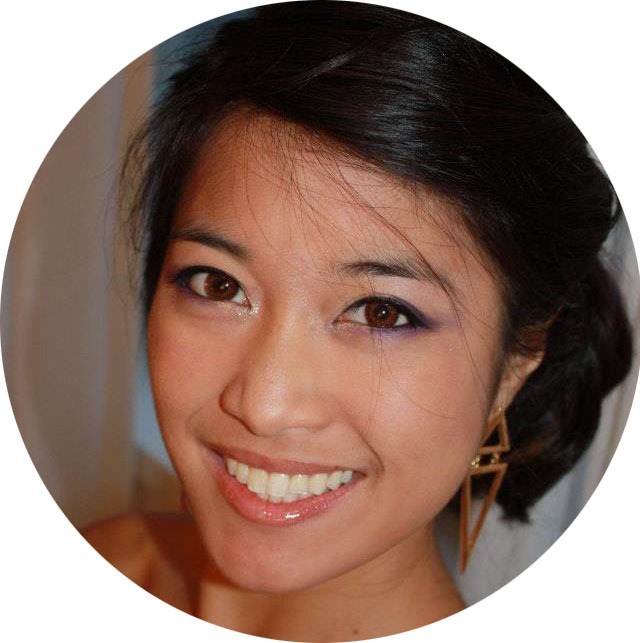 Thanks for stopping by… I’d love to hear from you so please leave YOUR thoughts in the comments below! A delicious holiday dessert with the perfect balance of sweetness and tart. 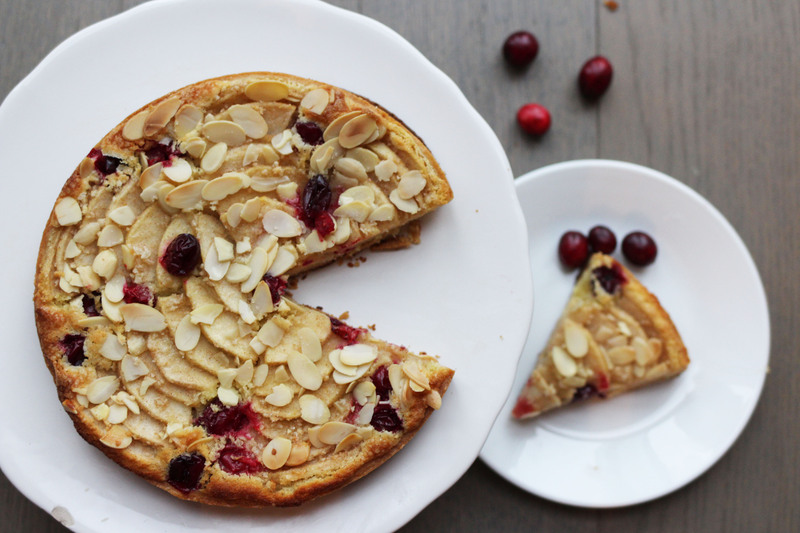 Fresh cranberries, apples, and a rich almond cream make for a well-rounded flavor profile that is a true crowd pleaser! Cream butter and powdered sugar with paddle attachment in a stand mixer until light and fluffy. Slowly add beaten eggs in 2-3 additions, scraping sides of bowl down as needed. To aid incorporation, add eggs at room temperature and increase mixing speed. Add flours and salt in all at once, and mix until just incorporated. Wrap dough in plastic wrap and place in fridge to rest 10 minutes. Using a mixer, cream together butter, sugar, and almond flour on medium until light and fluffy. With the mixer running, slowly add in egg until well incorporated. Add in the cornstarch and (optional) rum and mix well. Use immediately. Otherwise, beat until fluffy when ready for use. On a floured surface, use a rolling pin to roll out dough to about ⅛-inch thickness and roughly 10-inches in diameter. Line a tart ring with dough. Return to fridge to rest another 10 minutes. When dough is chilled, spread a layer of almond cream on the bottom of the tart, filling about 1/3-1/2 the depth of the tart. Be sure not to overfill as almond cream rises while baking and may bubble over. Arrange apple slices in a feathered, decorative pattern. I feather the slices outward from the center in 5 "spokes." 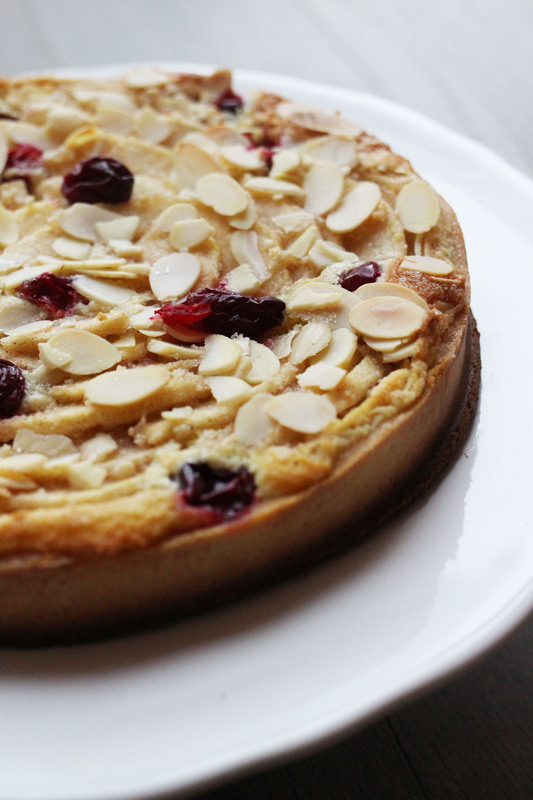 Sprinkle sliced almonds over the tart, particularly covering the "naked" exposed surfaces of almond cream. Sprinkle fresh cranberries over the tart taking care to uniformly distribute the fruit. In a small bowl, mix together the sugar, almond flour, and cinnamon. As desired, sprinkle a generous amount of the sugar mixture over the tart. Bake for 45-55 minutes until edges are golden brown and top of the tart starts to take on a light gold to golden brown color. Cool completely on pan before unmolding and serving. Cut into 8-10 slices, serve, and enjoy! * docking is the process of poking small holes in the dough to let trapped air and steam escape during blind baking. I use a fork to poke holes along the bottom of the tart crust. ** you can choose to use your favorite pie or tart crust for this recipe! Almond cream can be made ahead of time and stored in the refrigerator or freezer. Be sure to beat until fluffy prior to use as it will be cold and stiff from storage.